Looking for something simple to add a little luxury to your client's experience? Using a Treatment Dish by Noel Asmar is such a simple touch, that goes a long way! 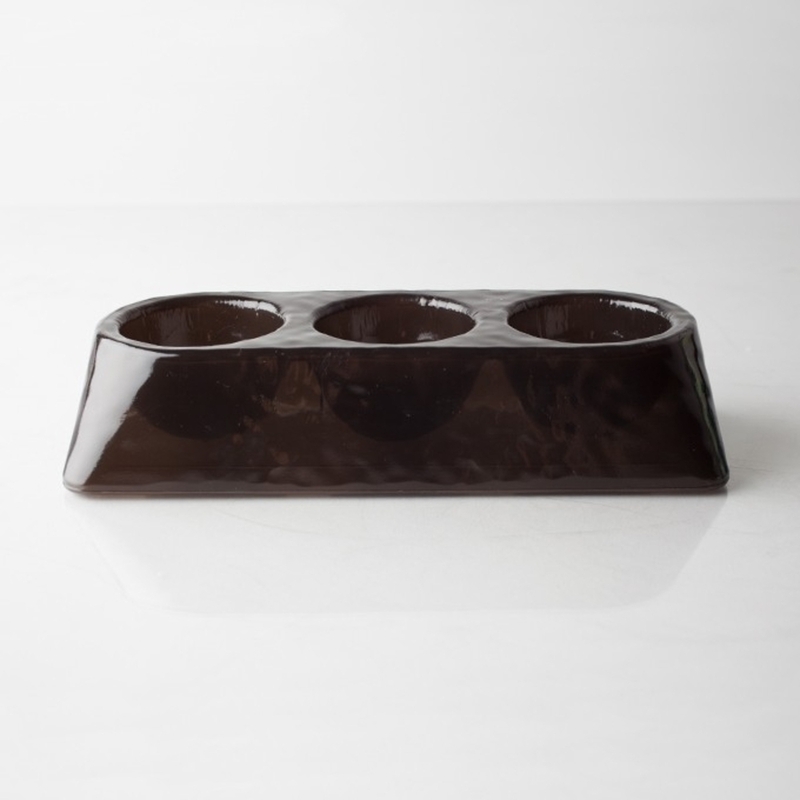 A simple, elegant, hygienic treatment dish, enhances any spa décor. The surface is non-absorbent and scratch-resistant, allowing the bowl to be thoroughly disinfected. This attractive treatment dish is both functional and beautiful. Featuring 3 separate wells to beautifully display up to four scrubs, lotions, or masques during a treatment. Also available in Onyx Black, Frost White, and Mediterranean Blue. It is easy to offer a variety of Spa Manicures and Pedicures in various scents to your clients with these great new Hand & Foot Therapy Packages from Amber Products. Amber Products recommends a 5-Step process for performing manicures and pedicures, and these convenient packages provide everything you need to offer your clients these luxurious services! Available in 5 delicious scents: Geranium Sage, Green Tea Mint, Lavender Aphrodisia, Tangerine Basil, and Vanilla Lemongrass. Gently cleanse skin and reduce bacteria with anti-microbial agents without stripping skin of hydration. Leaves the skin soft, smooth and refreshed. Begin hand and foot therapy with an effective yet gentle cleanser to wash away impurities and prepare hands and feet for treatment. Maintains hydration while deep-cleansing skin. Prepare for treatment by submerging hand or foot into effervescent water increasing circulation and relaxing the client. Essential oil aromas infuse the air as cuticles and skin are softened and prepared for treatment. Amber Hand & Foot Soak softens the skin, conditions cuticles and prepares the hand and foot for treatment. Effervescent tablets break down to create a soothing effect while diffusing essential oils and releasing minerals and salts into the warm water. Gently scrub away dead skin cells, breakdown callused skin and revive skin with Amber’s clay based scrub with apricot seeds. Leaves skin prepared to absorb vitamins and minerals quickly. Exfoliate and treat calluses, dry skin and aging hands and feet with Amber’s clay based Hand & Foot Scrub with Apricot Seeds. Soften and revive the skin using Algae Extract, Red Vine Extract, Arnica, Horse Chestnut Extract, Ivy Extract and Aloe. Peppermint Essential Oil is added to stimulate blood flow and create an intense cooling effect. Drives essential oils, vitamins and extracts deep into the skin increasing elasticity and moisture. Deep-cooling masque provides revitalization for tired hands and feet. Kaolin Clay, Bentonite Clay, and Glycerin combine in this invigorating Hand & Foot Masque to help hydrate and detoxify dry hands and feet. The cooling effect of Peppermint Essential Oil is used to stimulate blood circulation and further detoxify. Deliver nutrient enriched therapy to cracked, dry skin with essential vitamins and proteins. Massaging provides relief while Shea Butter further repairs cuticles and conditions nails. Increases shine of SOLO Gel Polish. Shea Butter, Cucumber Extract and Chamomile Extract are infused into a thick creamy formulation that leaves hands and feet supremely moisturized. Added botanicals and essential oils treat and heal dry, cracked skin and provide lasting hydration. Order one today and see how easy it is to add these luxurious treatments to your treatment menu!